Elite Car Care are proud to be an official fitting partner of Alloygator UK. Stocking the full range of products, they’re available to purchase via the online shop or have professionally installed while you wait. AlloyGator is a patented alloy wheel protection system which extends the life of alloy wheels. The AlloyGator sits between the alloy wheel and the tyre and offers wheel protection against kerb damage, saving time and money on repairs. Constructed using a ‘super tough nylon’, these protective rims will vastly reduce the risk of wheel damage. Alloygators are the first line of defense between the outer rim of your wheel and a kerb, they’re designed to protect against low speed impact such as parking or driving through a narrow width restriction. What’s the difference between the Standard and Exclusive Alloygators? The standard Alloygators feature the bevelled edge and are designed to fit 13-21″ wheels, whereas the new exclusive Alloygators have a rounded, less obvious profile and are designed to fit 12-24″ wheels. You can purchase a set of four alloygators in your chosen colour from £71.94 (incl VAT) plus postage and packing for DIY fitment. *UPDATE (01/11/2018) – Alloygator are no longer supplying the Standard Alloygators, they have been superseded by the Exclusives so we are only fitting these as a full set. We do still hold a small stock the Standard items for single replacements to existing customers. How long do they take to fit and do I need to book? The fitting time can take upto 90 minutes. All fittings are strictly carried out on an appointment basis, please call us on 01628 671213 in advance to arrange a suitable date and time. Can they be used with run-flat tyres? Yes they can, we have fitted numerous sets without any problems. Can they be re-used if you have new tyres fitted? Yes they can as the removal and refit of a tyre shouldn’t affect the alloygator, however an element of care must be taken by the tyre fitter to ensure they are not damaged during this process. Do they affect the inflation of the tyre? If fitted correctly they will not affect the inflation of the tyre. We recommend checking your tyre pressures 1 hour after fitting to ensure correct fitting and at regular intervals as recommended in your operating manual. Can AlloyGator be used on Machine Polished/Diamond Cut Alloy Wheels? 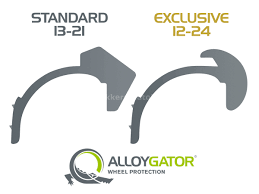 The “AlloyGator” alloy wheel rim protectors are not recommended for machine polished or diamond cut alloy wheels. Although fitting the product will provide superior protection against kerb damage, due to existing imperfections in the lacquered wheel surface our product may increase the risk of moisture retention and accelerate wheel degradation. Providing there is no minute damage to the wheel surface, fitting the “AlloyGator” wheel rim protectors will not cause damage on its own, however AlloyGator Limited or Elite Car Care Online Limited accepts no liability if the product when fitted causes such damage. Taking the above into account, we do still have many customers with machine polished wheels, that choose to use alloygators to protect their wheels. Consistant colour is maintained thoughout the product, which means that the colour is fully maintained after damage has been rectified. We recommend you regularly clean your wheels and AlloyGators with normal car shampoo or universal wheel cleaners suitable for delicate finishes like chrome. Avoid the harsh cleaners and thick, brush-on tyre shines used by some hand car-washes. Can you repair damaged Alloy Wheels prior to fitting Alloygators? Yes, we offer a Wheel Refurbishment service for all types of alloy wheels, more information can be found by the link or via our Professional Services page.